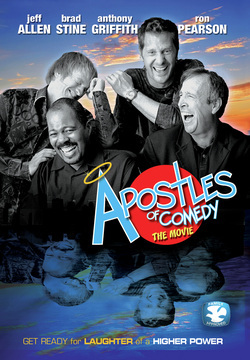 FOR IMMEDIATE RELEASE (Nashville, TN) - When award-winning comedian Jeff Allen, executive producer Lenny Sisselman and producer Mitchell Galin first envisioned the Apostles Of Comedy film (set for release September 9, 2008 from First Look Studios), they had two goals in mind. One, that the film would go beyond the stage antics of some of the top comedians in the country, showcasing not only their comedy, but also their personal testimonies of faith that have shaped their lives. And second, that it be funny. Really funny. "We chose some of the best comedians in the business," says Sisselman, who has produced comedy shows for over 26 years and worked with performers such as Jay Leno, Jerry Seinfeld and Tim Allen. "But we also chose comedians who specifically do family-friendly comedy that would appeal to all ages, something that the whole family could enjoy together." Emmy-nominated producer and Christopher Award winner Mitchell Galin, says Apostles Of Comedy reveals the true mission of the comedians. "Our weaving of documentary footage with performances was an attempt to show that these comedians have a purpose beyond just laughs per minute. They want to reach into people's hearts and souls." Along with Jeff Allen, Apostles Of Comedy features Brad Stine, Anthony Griffith and Ron Pearson, all comedians who have honed their craft in the most secular of entertainment venues, yet because of their personal beliefs, have kept their comedy clean and free of crude themes. "This film has been a dream of mine," says Allen, a recipient of the prestigious Grady Nutt Humor Award and frequently seen on Gaither videos. "We wanted to produce something that was counter-culture; something that would not only be funny, but move people emotionally. These guys are very diverse in their styles and backgrounds, but our Christian faith binds us together." For Brad Stine, who had never participated in a multi-comedian project, the combination of presenting both the on-stage performances and the off-stage real lives of the comics appealed to him. "Christians are normal people who have problems just like everybody else," says Stine. "We have all dealt with things in our lives that have challenged our faith, but that very real 'human condition' is the commonality we all share. We all have painful experiences. Comics mock the pain by being funny. That's our outlet." Stine, known for his edgy social commentary, has been featured on CNN, Fox News, New Yorker Magazine, as well as Promise Keeper events. Emmy-Award winner Anthony Griffith is a newcomer to the CBA market although he has been a Christian all his life. Making his living in comedy clubs and appearances on television sitcoms and drama specials, Griffith has been a frequent guest on The Tonight Show as well as HBO, Comedy Central, and The Bernie Mac Show. Griffith says he regularly receives compliments from his secular counterparts who use harsh language or vulgar subjects to get laughs. "I've been in clubs where other comics have come up to me and said, 'We wish we could do what you do,'" says Griffith. "When you stay true to yourself, it shows. Bill Cosby used to say, 'Please the people who like you and don't worry about the others.' I've tried to just stay true to my beliefs and as I result, I'm comfortable in any setting." Griffith, who shares his personal testimony for the first time on Apostles Of Comedy, lost a young daughter to cancer and was later himself diagnosed with MS. During one particularly poignant conversation in the film, he talks about how tragedies have affected his faith. "Life is like a novel," he states. "You laugh, you cry, but you want to keep turning the pages because you want to know how it ends. You're the main character and God is the author." Ron Pearson is long-time friends with Griffith (Anthony is godfather to Ron's daughter), and like Griffith, has made a name for himself appearing on various television sitcoms such as Malcolm & Eddie, The Drew Carey Show, That 70s Show, The George Lopez Show, among others. Pearson was also drawn to the Apostles Of Comedy project because of its generational appeal. "There really is a void out there of comedy that is uplifting," says Pearson. "This film features quality comedy that is not dumbed down at all, but is also something the entire family can enjoy. There is a culture war going on for the soul of this country right now. And while we may not win every battle, hopefully quality projects like this will stand-up against any secular counterpart out there." A tour featuring the four comedians is in the works, and Jeff Allen hopes the tour becomes more than just a night of comedy. "I would love to see scenarios where we go in and do the show on a Saturday night," says Allen, "and then share our testimonies in the same church on Sunday morning. Comedy has a way of breaking down barriers and becoming an outreach to people who might not go to a church to see a music concert or other event. We want people to laugh and have a great time, but we also want people to be touched on a spiritual level." Apostles Of Comedy will be released nationwide on September 9, 2008 by First Look Studios. First Look Studios is a leading independent studio which includes its theatrical, home video and television operations. The studios' CEO is Trevor Short and Dean Wilson is COO. The company is owned and operated by First Look Holdings, LLC. For a sneak preview of the DVD, visit: www.ApostlesofComedy.com.